Nigerian police detained two suspects after two shots were fired today in the vicinity of the U.S. embassy in the capital, Abuja. 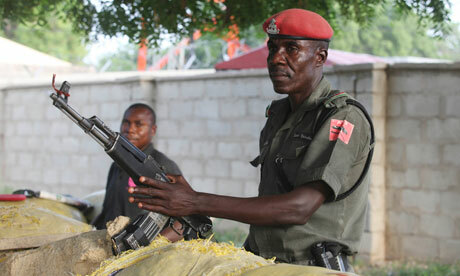 Abuja, Moshood Jimoh, said by phone he was unaware of the incident. I had the lucky timing to arrive to Bane, Nigeria, the hometown of Saro-Wiwa, on a Thursday morning. 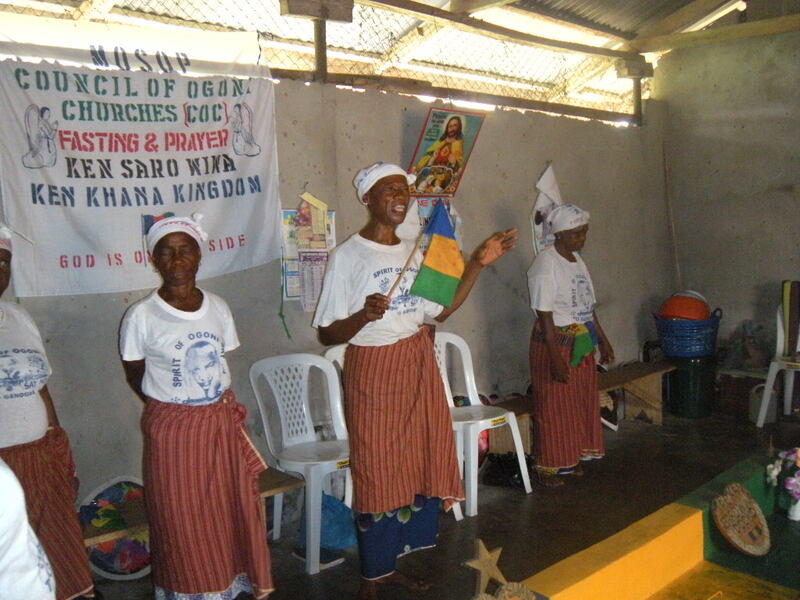 This was fortunate because every Thursday at 6 a.m. the women of the area, and a few men as well, conduct their weekly prayers and fasting at Saro-Wiwa’s tomb. The event lasts until the afternoon, and includes singing, dancing, reading of bible passages, and even a nap when the temperatures rise. It is a sight to behold, a completely unforgettable experience to be a part of. Before Saro-Wiwa’s death in 1995, members of the Ogoni movement fasted with him once a week. After his execution the gathering became more popular and community women incorporated prayers to a greater degree. Today, around 25 women continue to gather once a week and it has become almost indistinguishable from a Christian church service. 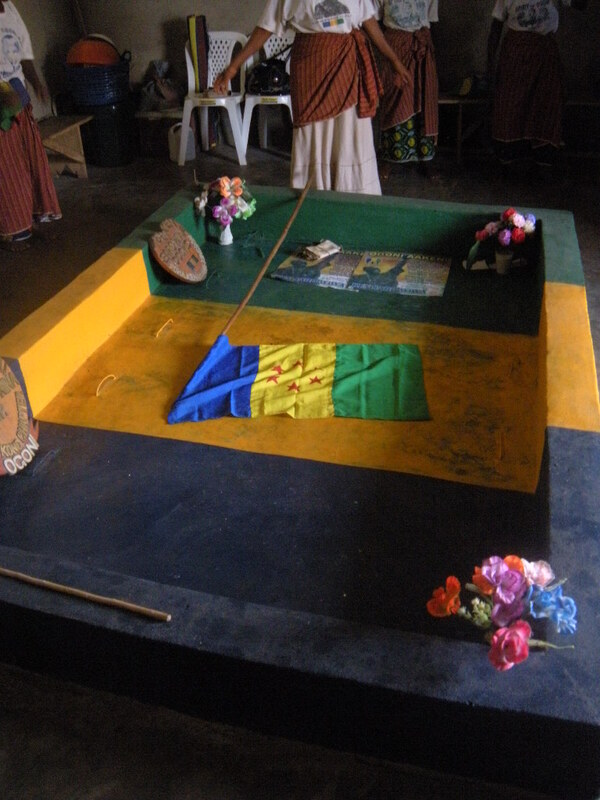 The attendees take turns touching the grave, the language used is derived heavily from the bible, and women refer to Saro-Wiwa as a martyred living Christ. Their purpose in coming together is to pray for another “messiah” (their term) to bring them out of their conditions of poverty. They also spend all day Sunday at church as well, meaning that two whole days per week are spent in worship for some of them. They bring all Ogoni flags designed by Wiwa, all wear matching t-shirts depicting Ogoni pride logos, and some also have matching wrapper tied around their waists. Because of the high level of Ogoni identity inherent in the prayers, I was happily surprised at how open the worshipers were to an outsider like I am. I gave a speech about my interest in Niger Deltan history, answered their questions, and they welcomed me warmly. The two days per year when the tomb is visited most are November 10, the anniversary of Saro-Wiwa’s death, and Ogoni Day on January 4, which attracted a reported quarter million people on its first celebration in 1993. The grave site is kept locked and sometimes guarded on days other than Thursdays and these two holidays, so my arrival couldn’t have been more fortuitous. After he was executed on November 10, 1995, Ken Saro-Wiwa was buried in a mass grave in Port Harcourt cemetery, unmarked. The Ogoni people then used their mysterious powers to exhume the body of Wiwa specifically and take him home. His body was brought back only a few days after his execution and burial. The day they brought his body back, there was very serious rain and nobody could come out, yet some were still able to bring his body back to Bane. 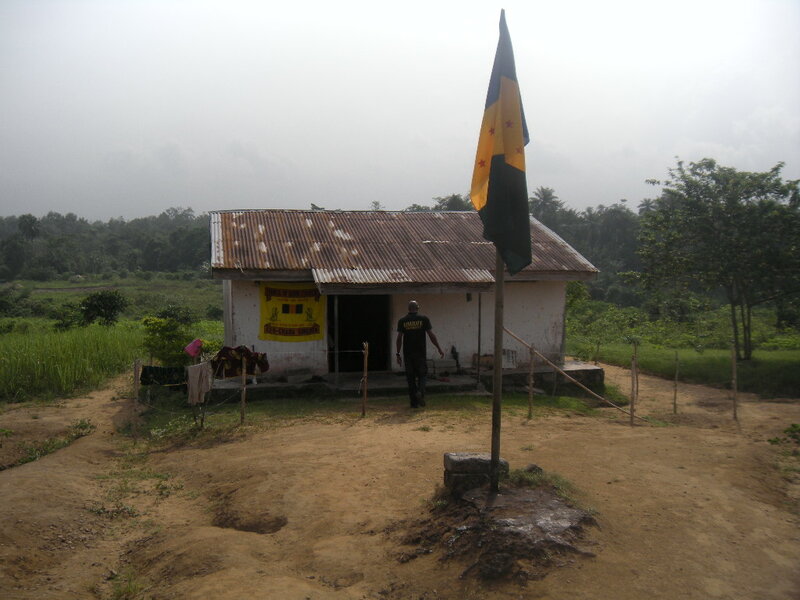 He was given this tomb near farmland so that it could be a pilgrimage site for visitation, but also to respect Ogoni beliefs about death. In the Ogoni tradition, anybody who dies under mysterious causes, like drowning in the sea or because of some accident, the family will bury the body away from home, especially by water. This is because the nature of the death was dangerous, so bringing the body to the family compound for burial, as is usual in a natural death, might affect those who are still living in that house. American children can identify their own birthday almost as soon as they enter school. It is just one of those things we always know. During the process of interviewing I have seen how that isn’t true in rural Nigeria, especially among older folks. My subjects often don’t know their birthdays so they date themselves in relation to others, or to major social events. The most common referential event is the Biafran War or a violent conflict with a neighboring community. One woman said that at the start of the Biafran War (1967) she already had two children, which means she was probably born in the early 1950s since she probably started having children around 15 or so. Another woman said that she had not yet grown breasts at the start of the War, so she was probably around ten then. She added that she had yet to hide herself from men at that time. Her sister-in-law said that she herself was born on the day of Ogoni independence, which after some clarification came to mean Nigerian Independence on October 1, 1960. In general, most folks guess their age based on when they started or ended puberty in relation to a political event. Additionally, children are aged according to their siblings, so one’s age matters less than relative birth order in the family. People seem to be unconcerned with how old they are, so they don’t bother to think about it; it just isn’t really applicable to their lives. When I figured out some of my interview subjects’ birthdays to within a week or so based on surrounding events, most of them shrugged their shoulders because it just didn’t really matter to them. In terms of gathering my field data, it is difficult for respondents to answer my questions about when an event, e.g. a conflict with a neighboring village, took place. We can usually guess events of the last two decades within a few years based on which President was in office and which children in the family had finished primary school. Calendars are a rarity. Ultimately, they are farmers. What matters is the start and end of rainy season, the week that they should plant and uproot, and when their cassava is ripe for harvesting. They keep track of days of the week in order to know market days to buy and sell their produce. For Igbos for instance, there are four days in the week and all are based on market trading. Dates don’t dictate their lives in the rural Delta. I have been wondering how the new ubiquity of cell phones might change this in the coming years, but I still have faith that as long as my respondents depend on agriculture for their livelihood, the crops will continue to decide what day it is.